It’s never too late to learn how to swim. If you never had the opportunity as a child, you can easily how to learn swimming as an adult. At first, being in the water may feel strange, unfamiliar, and even a little worrying. But with time you’ll become acclimated, gaining a level of confidence you may have previously thought unimaginable. Once you learn how to swim, you’ll be able to enjoy a variety of benefits. For example, swimming is an excellent form of exercise. It’s also relaxing; it can relieve your stress and calm your nerves. And if you’re feeling blue, 15 minutes in the water may be all you need to lift your spirits. Getting started is easy. 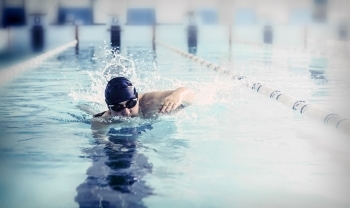 Read on for seven simple tips on how to learn swimming as an adult. It’s natural to harbor fear of the water if you’ve spent little time in it. One way to overcome that fear is to start in the shallow end of the pool. There, you’ll be able to stand in the water, lowering yourself according to your comfort level. Practice holding your breath while your head is under the surface, knowing you can come up for air whenever you wish. You’ll find it’s much easier to see underwater if you wear goggles. Additionally, goggles make swimming more comfortable since they prevent water from getting into your eyes. Being able to see clearly while your head is beneath the surface will make learning to swim more enjoyable. Gaining confidence and becoming a proficient swimmer requires that you spend sufficient time in the water. The more time you spend, the more comfortable you’ll feel and the better swimmer you’ll become. We realize it can be difficult to set aside time to regularly climb into the pool. But it’s the only way to learn how to swim. Keep in mind, you don’t need to practice every day. Once a week might suffice. Allow more than a week to pass between sessions and you may find it difficult to make forward progress. Our state-of-the-art, indoor swim facility is open year-round so you’ll never want for a place to practice. One of the biggest challenges for adults who are learning how to swim is keeping their faces in the water. It may feel uncomfortable. It can even cause mild anxiety for some. With the exception of backstroke, every stroke requires your face to be underwater a significant portion of the time. Getting used to the feeling is an important part of learning to swim. Use your arms to move underwater while holding your breath. Experienced swimmers make freestyle look easy. But in fact, the stroke is made up of several forms that work in concert to ensure smooth, efficient movement through the water. When you’re learning how to swim as an adult, don’t think of freestyle as a single stroke. Instead, think of it as a series of strokes, each of which need attention. Focus on the positions of your wrists as your hands enter the water. Concentrate on the positions of your elbows and forearms as your hands sweep from overhead to your hips. Pay attention to the roll of your body, your flutter kick, and how you exhale as your head turns downward in the water. Freestyle is easy once you get the hang of it. But it’s important to master all of the individual movements that make up the stroke. When learning freestyle, it’s helpful if you’re moving through the water. Fins can be invaluable for that purpose, especially in the beginning. They’ll give you the forward movement you need to learn the individual mechanics of the stroke. Are using fins cheating? Perhaps if you never take them off. But they’re a useful tool when you’re just starting to learn how to swim. If you’re interested in how to learn swimming as an adult, it’s recommended that you take lessons from someone with experience. That way, you’ll learn proper stroke technique from the beginning. You’ll also avoid developing bad habits that will hamper your progress. The instructors at the DuPage Swimming Center have years of experience teaching both adults and children how to swim. Many of them swam competitively, honing their technique along the way. As part of our professional staff, they now train others, giving them the tools they need to enjoy swimming for the rest of their lives.